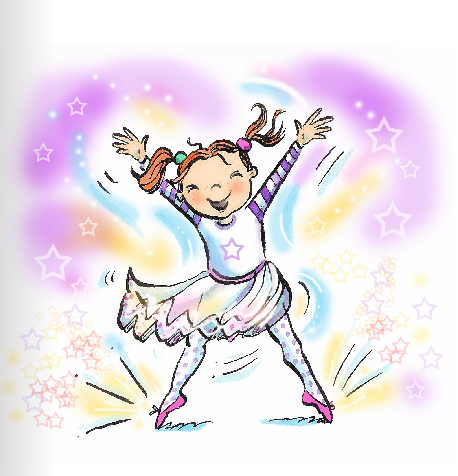 "Inspiring & motivating young children to enjoy the world of ballet & dance through imagination & play"
We’ve had lots of interest in our exciting dance programme ‘Dance with Twinklesteps’ for 3 – 6 year olds, so we thought it would be useful (and fun!) to share the very special qualities of a ‘Dance with Twinklesteps’ teacher. We have written and presented the Dance With Twinklesteps programme with the understanding that the teacher has experience in teaching young children and has a strong background training in dance and in particularly ballet. Twinklesteps teachers carefully teach the foundation of ballet technique by following the guide lines in the Twinklesteps syllabus, which uses parallel feet for the very young child. The progression exercises in the syllabus provide a natural and safe development for the children to progress to the next level (primary). For more on what’s included in the Dance With Twinklesteps programme see here. Well Number 1 of course is that all our teachers love children and enjoy interacting with them. They also have the ability to make things fun. Our teachers are great at getting the right balance of structure, imagination and play. Drawing on play as the natural learning method of younger children, means you’re working with, rather than against, your class. Dance with Twinklesteps teachers incorporate role play, storytelling, sensory experiences and, of course, participation. At Twinklesteps we’ve found that engaging the children in the story telling, asking them about their ideas and then acting them out in the class really works: incorporating chances for the children to be involved in the class makes them active and interested learners. Since these are very young children who love to (and learn through) play, our teachers are able to immerse themselves in all the imagination of this age group and encourage the children to use their own imagination within the class. To be creative and imaginative, to be able to motivate and excite the young children in the class, encouraging the relationship with the main character Twinklesteps, is a great quality for our Dance with Twinklesteps teachers. We always say to new teachers that it’s important to keep the Twinklesteps’ character real and a focus point in the class, as an inspiring role model for the children and as a tool to base the learning around. After all, we created Twinklesteps as a little girl who loves ballet, so children should feel an affinity with her (Twinklesteps’ best friend Jett has been created as a role model for boys). The addition of her magical fairy powers taps into the imaginative world of this age group and helps them learn some basic ballet steps and movements through imagination and play. The fact that Twinklesteps has shoes that sparkle when she points her toes encourages children to point their toes too. Linking the characters from the Twinklesteps book in the class and even adding some of the children’s own imaginary characters helps the childrens enjoyment of, and learning within, the class. Leading on from this, Twinklesteps teachers are also great at taking a flexible approach. When teaching this age group on some days you have to be prepared to throw out your planned lesson and go with the mood of the children. This doesn’t necessarily mean always thinking on your feet, many of our teachers have worked out a plan B, C and D to deal with any situation! If the children are lacking in focus for a technical exercise, a back up plan (something more play based for example), can really help. Being able to assess the ability of each child and plan the class to suit the children makes life so much easier for our teachers. The accompanying Dance With Twinklesteps programme music is aimed at encouraging teachers to be flexible in helping the children to respond in different ways through dance. All our teachers are genuinely warm and kind, with an encouraging style. They understand that young children respond really well to reward and praise and they recognize children’s efforts. Stickers, certificates and praise all help the children to feel proud of their efforts and pleased to be in the class. Children move on from ‘Dance with Twinklesteps’ with a basic foundation in ballet as well as having enormous amounts of fun! The syllabus is intended to be entertaining but also educational as we aim to encourage a love of dance and music in a natural and progressive way through play, storytelling and imagination. To find out more about our dance programme ‘Dance With Twinklesteps’ visit here. Email Yvonne MacGregor (‘Dance With Twinklesteps’ creator and coordinator) at info@twinkesteps.com if you’re interested in becoming a ‘Dance With Twinklesteps’ teacher. This entry was posted in Ballet inspiration, Info for Ballet Teachers, Twinklesteps News, Twinklesteps products and tagged ballet slippers, children, Dance with Twinklesteps, teaching ballet, twinklesteps, young children on May 11, 2016 by twinklesteps. 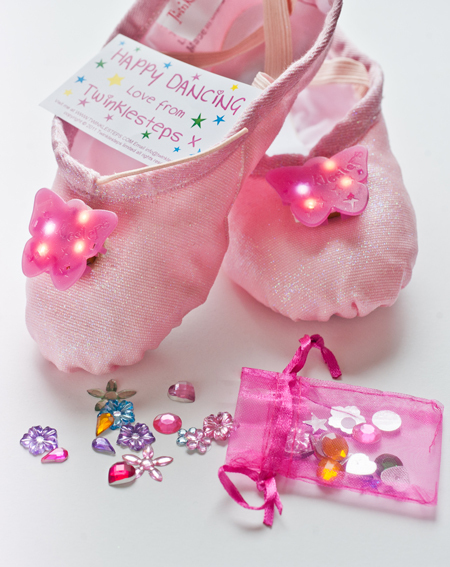 Pre Launch pair of Twinklesteps’ light-up ballet shoes to win!! We have an explosion of exciting news to share with you today! My beautiful new dressing up ballet shoes are almost ready to launch and to celebrate we have a pair your child can WIN over on our Facebook page. Here’s a photo for you fresh from our first photo shoot. What do you think? The shoes light up when your child dances and they come with a little bag of jewels so they can decorate the shoes themselves. They’re not ready to buy in our shop just yet so the only way to get hold of a pair right now is to enter our Twinklesteps colouring competition! We can’t wait to see your drawings! Contest ends on October 14th 2014. This entry was posted in Competitions, Twinklesteps products and tagged ballet shoes, ballet slippers, Dance, dancing shoes, dressing up shoe, light-up ballet shoe, new product, sparkly ballet shoe, twinklesteps on October 2, 2014 by twinklesteps. Hellooo everybody, we hope you’re well. As we rattle on towards the summer holidays we thought it was time to share with you some of our fab products to keep your children enjoying masses of dancing and imaginative play all summer long, whether or not they’re too little to have mastered any ballet steps. Our shop is bursting with lovely products so today we want to share with you just a few of our favourites. We are now selling our very own fantastic range of pink canvas split sole ballet shoes too, with sizes starting from as small as child size 6. The shoes come with attached elastics, so no worrying about having time to sew! We love these shoes, just pull the draw strings for a more snug fit. Even if your child is too young for ballet or has never tried a ballet class, you’ll be amazed how quickly they take to ballerina play once they try on a pair of our ballet slippers. They’ll soon be trying ballerina turns around the house and showing off their ‘ballet moves’. Our ballet shoes are available in our shop here. Make sure you find out just why we love ballet shoes in our blog post here and get some inspiration on ballet steps for young children here. 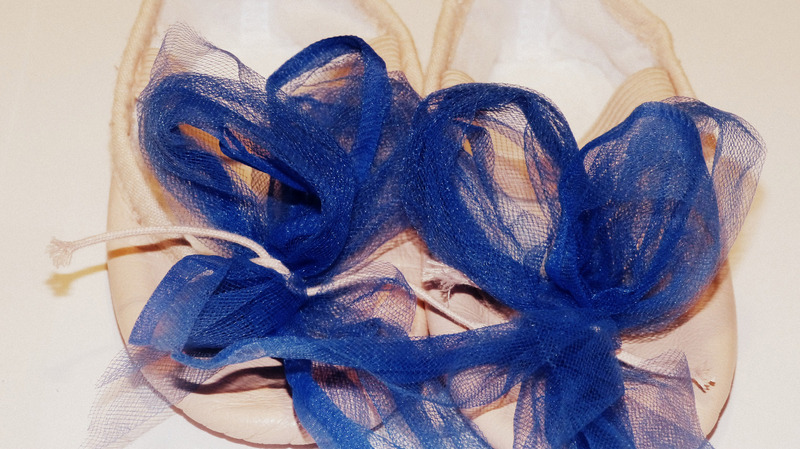 This entry was posted in Ballet inspiration, Ballet Shoes, Twinklesteps products and tagged ballerina, ballet, ballet shoes, ballet skirt, ballet slippers, children, Dance, fairy dust, imaginative play, shop, tutu, twinklesteps on June 5, 2014 by twinklesteps. Shiny New Website now LIVE! We’re SOOOOO excited here at Twinklesteps because we now have our fantastically super-duper shiny new website to share with you! We wanted to make it lots easier for you to find out all about us and browse in our shop for gorgeous dance wear, ballet shoes and gifts. You can also play games on Flash enabled devices: dress up Twinklesteps in her ballet outfits and choose her magical location – kids love it. We hope you like the new site as much as we do – let us know in the comments section below! We’ve put some special offers up which will hopefully bring a smile to any young ballerina’s face. 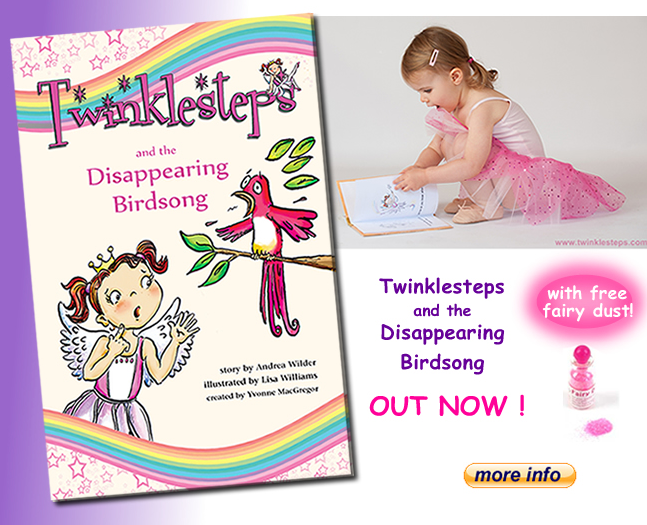 You can now buy Twinklesteps’ first ballet adventure book: ‘Twinklesteps and the Disappearing Birdsong‘ with a ballerina goodie bag….a perfect present for a special someone. You can now buy your child’s ballet shoes direct from our shop – yey! Our sparkly ballet play shoes are coming soon, with gorgeous lights that sparkle when your child dances – sign up to our enewsletter from the new website homepage to be get an alert when they’re launched. We hope you find a little something to buy as a surprise for a special young dancer you know. Here’s that shop link again. This entry was posted in Ballet inspiration, Dance wear, Twinklesteps products and tagged ballet, ballet shoes, ballet slippers, book, children, Dance, dancewear, gift, imagination, twinklesteps on May 15, 2014 by twinklesteps. It’s almost Easter and we’re soooo excited. If your kids love ballet we thought it would be really fun to have a ballet theme to the Easter egg hunt. Let the egg hunt begin! so this egg hunt is ballet themed, are you ready to play? show us first position before you find this new clue label. then off to find the next clue beneath the computer desk. straight to the princess’ bedroom where the sleepy princess goes. can you show us fourth position before you run to look? you’ll find it in the garden, in a special shoe it lies. 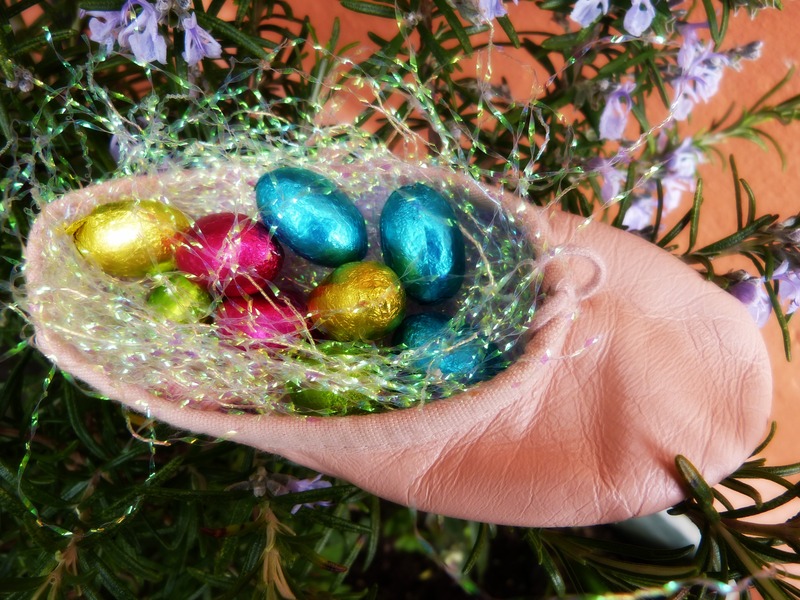 Hopefully you’ll hear squeals of delight as your children find that the Easter bunny has left them some chocolate eggs tucked into one of their ballet slippers. Whoever knew the Easter bunny loved ballet! Add more clues, make up your own or print out ours. Most importantly, have fun! This entry was posted in Ballet Craft & Play, Ballet inspiration and tagged ballerina, ballet, ballet shoes, ballet slippers, children, Easter, Easter egg hunt on April 10, 2014 by twinklesteps. We love ballet shoes here at Twinklesteps. The possibilities feel endless and creativity flows freely once a child puts on a pair of ballet slippers. Even before children are old enough to learn ballet steps, just putting on ballet slippers can make them feel like a dancer and inspire them to do some creative movement. Ballet slippers are close fitting and comfortable and make the wearer feel elegant and light footed – they aren’t like other shoes in that they give the illusion and feel of being barefoot. They also enable the wearer to move from a flat footed position to an elevated position on the balls of their feet. Both ballet slippers and pointe shoes (see below) mean that when the dancer’s toes are pointed the ballet shoes extend the line of the leg to it’s longest possible appearance. Most ballet slippers are made of a thin leather sole stitched to soft leather uppers and held onto the dancer’s foot with a single piece of elastic over the instep. 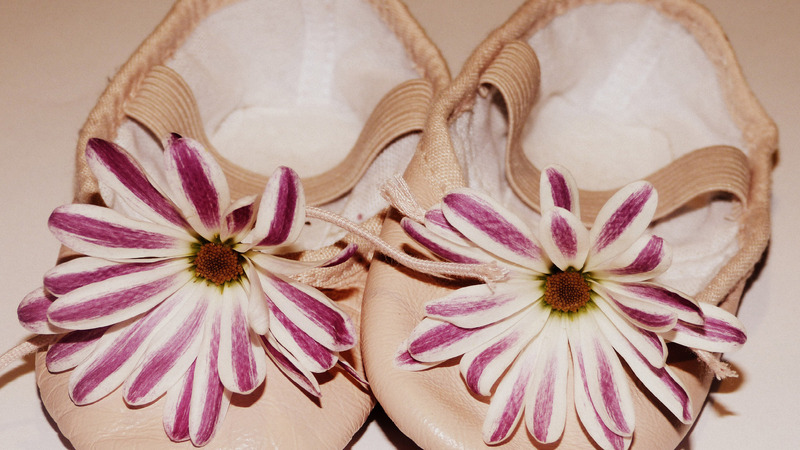 Although leather is the most common material, ballet slippers can be made of satin or canvas as well. The colour of ballet slippers varies and although you’ll generally see them in pink or white (or black, white or skin tone for men), slippers can be made in any number of colours. We’ve had a lot of fun on Pinterest putting together various ballet shoe boards. 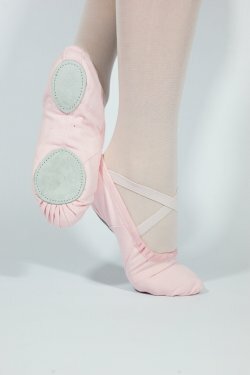 Check out our ‘Ballet Shoes for Dance and Play’ board here. Happy dancing from the Twinklesteps Team. Watch out for our magical play shoes coming soon in our shop. This entry was posted in Ballet inspiration, Ballet Shoes, Dance wear and tagged ballet, Ballet dancer, ballet shoes, ballet slippers, children, Dance, en pointe, imagination, pointe shoes on February 28, 2014 by twinklesteps. Who loves being creative? Well this week we thought it would be fun to be creative with ballet shoes. Children love using ballet and dance to transport them into a different place and one really fun way of encouraging young children to love putting on their ballet shoes is to decorate them. 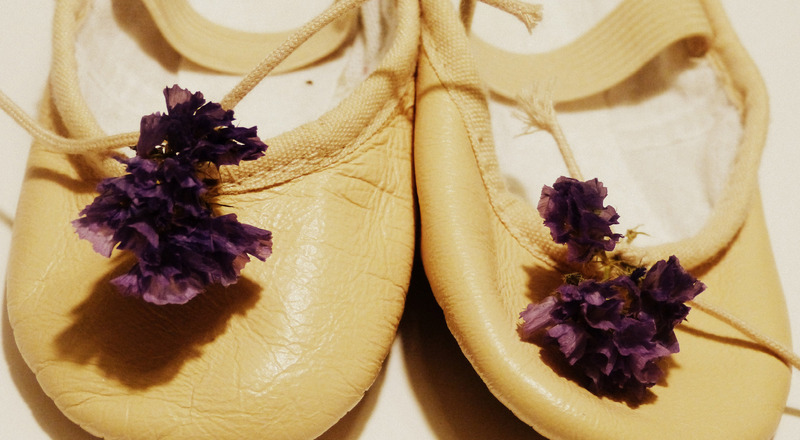 Another simple idea is to attach a flower to each ballet slipper: dried or fresh both work well. Now it’s time to enjoy some dancing and dressing up. Put on some music and have fun! Do post any creative ballet shoe ideas you’ve tried to us at info@twinklesteps.com or post your photos on our Facebook page. Let us know what you think in the comments below. 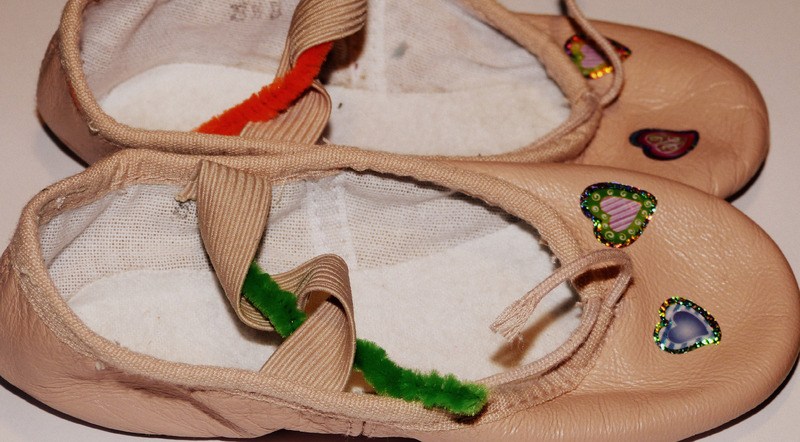 Psssst, watch for our very special sparkly ballet slippers coming soon in our shop. Happy dancing and decorating, from the Twinkle Team. 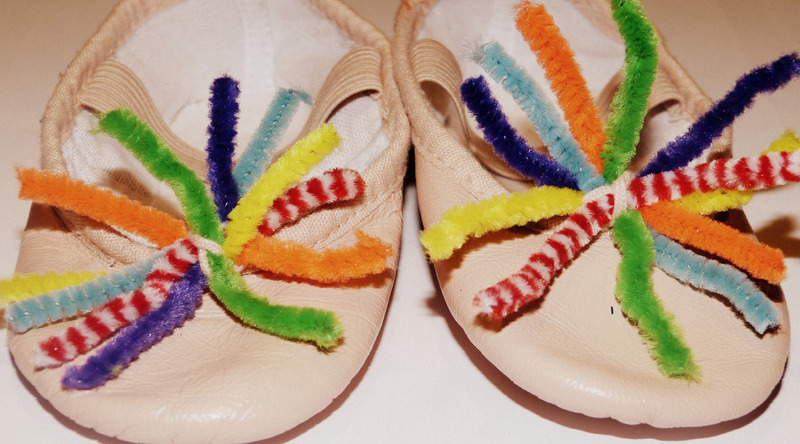 This entry was posted in Ballet Craft & Play, Ballet inspiration, Ballet Shoes and tagged ballerina, ballet, ballet shoes, ballet slippers, children, creative, Dance, decorate, imagination, magic, play, twinklesteps on February 14, 2014 by twinklesteps. My new Magical Ballet Book!